In the non-winter months the water gently drops over the granite face of the waterfall while retaining the stillness of the upper pool water surface. As a result, the still water is subject to the action of wind and the reflection of light and sky. The water falls down the face and surface tension holds a thin film of water to the face to create a wet wall along the black polished granite. The Square is reflected in the wall through the film of water. In the winter, the wall is dry but still retains a reflective quality. The edge that receives water from the reflecting pool allows a v-shaped break in the wall to take a higher volume of water and direct it to a channel. This action both concentrates and speeds up the water allowing it to splash onto a pyramid-shaped form and into the pool below. The rough, black granite material on the v-shaped break and pyramid accentuates the stirring water and helps create the sound of rushing water. This sculpture incorporates motion-activated tubes of LED lighting to join the upper and lower pools and interact with the waterfall. 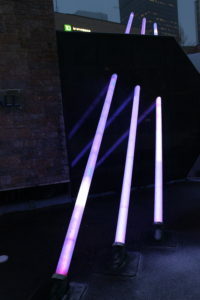 The lights read as rods of pure light and are highly visible from ground level, but do not restrict the view of the Square from the upper-level roof plaza. Biography: Frost graduated with an Honours Masters of Architecture degree from Montana State University in 1970. He worked with leading design-oriented architects for six years before starting his own practice. Frost’s work commitment to design excellence has generated a new and fresh approach for a wide range of projects. He maintains a keen involvement in all aspects of design with a particular interest in modern design. Frost’s leading-edge research into new processes, materials, and technologies, as well as collaboration with engineers, contractors, and fabricators all contribute to his innovative and contemporary design solutions which have been featured in national and international publications. He has received numerous awards and recognition in the practices of Architecture, Industrial Design, and Public Art throughout his career, including an Award of Excellence and Urban Design Award for his work as the Project Design Architect for Edmonton’s City Hall.